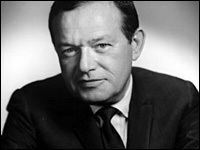 Jule Styne (; December 31, 1905 – September 20, 1994) was a British-American song writer and composer known for a series of Broadway musicals, which include several famous and frequently revived shows. Styne was born in London as Julius Kerwin Stein to Jewish immigrants from Ukraine, the Russian Empire who ran a small grocery. At the age of eight he moved with his family to Chicago, where at an early age he began taking piano lessons. He proved to be a prodigy and performed with the Chicago, St. Louis, and Detroit Symphonies before he was ten years old. Styne attended Chicago Musical College, but before then he had already attracted attention of another teenager, Mike Todd, later a successful film producer, who commissioned him to write a song for a musical act that he was creating. It was the first of over 1,500 published songs Styne composed in his career. His first hit, "Sunday", was written in 1926. In 1929, Styne was playing with the Ben Pollack band. In 1947, Styne wrote his first score for a Broadway musical, High Button Shoes with Cahn, and over the next several decades wrote the scores for many Broadway shows, most notably Gentlemen Prefer Blondes, Peter Pan (additional music), Bells Are Ringing, Gypsy, Do Re Mi, Funny Girl, Sugar (with a story based on the movie Some Like It Hot, but all new music), and the Tony-winning Hallelujah, Baby!. Styne wrote original music for the short-lived, themed amusement park Freedomland U.S.A. which opened on June 19, 1960. His collaborators included Sammy Cahn, Leo Robin, Betty Comden and Adolph Green, Stephen Sondheim, and Bob Merrill. He was the subject of This Is Your Life for British television in 1978 when he was surprised by Eamonn Andrews in New York’s Time Square. Styne died of heart failure in New York City at the age of 88. His archive - including original hand-written compositions, letters, and production materials - is housed at the Harry Ransom Center. Styne was elected to the Songwriters Hall of Fame in 1972 and the American Theatre Hall of Fame in 1981, and he was a recipient of a Drama Desk Special Award and the Kennedy Center Honors in 1990.